In honor of Valentine's Day, the Kulinarya Cooking Club was challenged by KCC member Pia to make a Filipino dish with an aphrodisiac. My response is a variation on Pancit Molo, which is essentially Filipino wonton soup. In this case, I simmered pre-made Chinese wontons in chicken broth infused with grated GINGER -- ding! ding! the love ingredient -- for ten minutes. When cooked, I transferred them to a bowl with just a little of the broth, spooned a little spicy soy mixture over them, and served them with minced scallions. Wet, hot, slippery, and stimulating on the tongue ... do I need to say more? 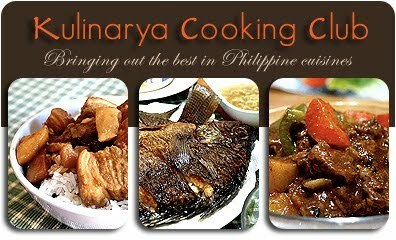 If you’re interested in joining our Kulinarya Cooking Club and participating in its monthly challenges, please visit http://au.groups.yahoo.com/group/kulinarya, and become a fan on our Facebook page. Kulinarya was started by a group of Filipino foodies (Kath, Trisha and Trissa) living in Sydney, who are passionate about Filipino culture and its colorful cuisine. You don't have to be a Filipino or have a food blog to join, and you can participate as much or as little as your time and interest allows. Everyone is welcome. Bring chicken stock to a boil -- you should have enough stock that the wontons can simmer freely and not be too crowded. Take a knob of ginger, cut the end off and shave off some of the outer skin near the end, maybe 1/4-1/2 an inch. Using a grater (I use a Microplane), grate some ginger into the broth. How much? This is up to you. Grate the ginger several times, up and down, up and down, and up and down, and then tap the grater on the edge of the sauce pan, to drop the grated ginger into the pan. Do that one more time. Taste the broth. If you want more ginger, grate some more in. Add the wontons, and when the broth comes up to a boil, turn down the heat until it's at a gentle simmer so that the wontons don't break apart. Follow the directions on the wonton package and cook them until they're done. While the wontons are cooking, mix your dumpling sauce out of the soy sauce, rice vinegar, sugar, and spicy sesame oil. 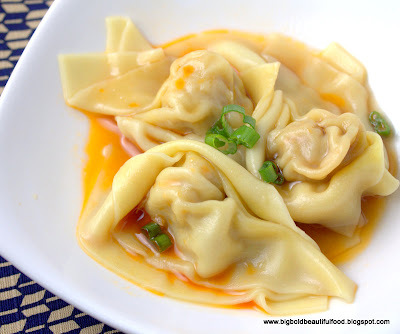 Using a slotted spoon, put the wontons in a bowl or on a plate with curved sides. Spoon some chicken broth over the wontons. Spoon some dumpling sauce over the wontons. Sprinkle with some minced scallions. Serve to the object of your desire. Happy Valentine's Day! Hi Ninette! Love The idea of a Ginger broth! Pancit molo is one of my all time favorite comfort foods and your broth sounds like it could be a favorite too! Ninette=) That looks really good...and I love your description, hehehehehe! Hahaha I love it! Wet, hot, slippery.... belated happy valentine's day! This theme is spot on!!! Mmm I love the slippery texture of wontons. These look fantastic and, like Trissa, I think the ginger broth is inspired! You have been cooking up a storm:) I too love the ginger broth idea..thank you. Hi Ninette! Nice Wontons! Interesting intro. :) Looks tasty, but I'd probably have them with noodles. Yum! I just want to curl up on a sofa, watch TV and have this soup right now. Love it! I've never thought about wontons being a sensual food. I'll never look at them the same. Hi, Ninette! Ha!ha!ha! you're hilarious. Thanks for the laugh=;) Love your description w/ your dish. Creative!! i can slurp this especially w/ this cold weather=;). Thanks for sharing! Those wontons look very delicious. My mouth is getting watery right now as I write this comment. My goodness, well done! I love wontons! Love the sauce you have prepared. Must try soon. I didn't know that molo's an aphrodisiac! I'll see it differently from now on ;-) well done! LOL at your description of the wonton soup! Your picture looks so drool-worthy! Great job! what a great idea for infusing ginger on the broth. for some reason, I couldn't think of anything for this month's cooking challenge... i guess i need to hone up my skills on the "aphrodisiac" avenue haha. I will never look at wanton noodles the same way... i will be in the wet-hot-slippery mindset when I eat them haha... great job ninnette! Yummy! I love wontons and will definitely try out your recipe in the next few days!